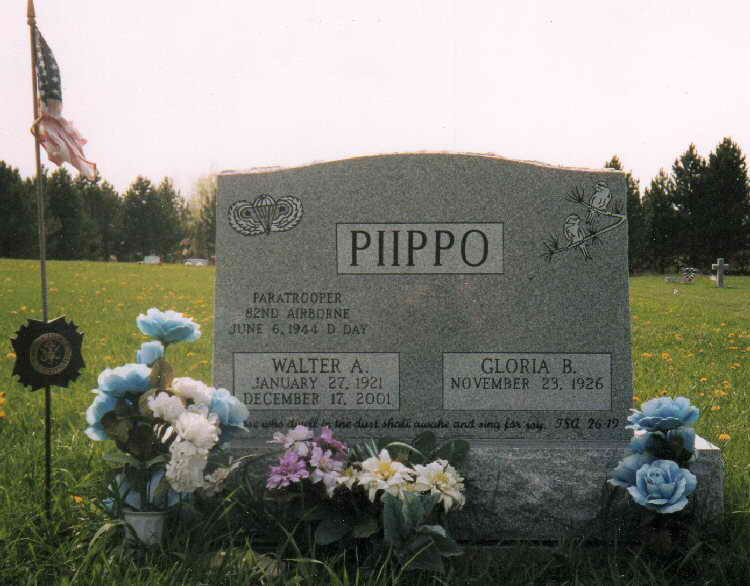 Walter A. Piippo, 80, [1922 - 1982], died in Chatham, Michigan and is buried in the Pine Grove Cemetery in Rock River Township near Chatham, MI. Walter was 100-percent Finnish, and was the son of Mr. and Mrs. Jack Piippo of Chatham, Michigan. He served in D Company’s 2nd Platoon. Machine gun crew? He was wounded on Hill 95, and was wounded again (possibly on 10/14/44) in Holland. According to his wife Gloria said he was unconscious for about 52 days. Walter was discharged from the Army in May 1945 after three years of service and he was back in the Upper Peninsula of Michigan when the war ended. He went to a local movie theater—twice!—to see a film of the 82nd Airborne Division in the victory parade in New York City. On 8/28/46, he married Munising, Michigan’s Gloria Barbara Spencer. They named their first son Daniel Gavin Piippo. Around 1978 he and Gloria had a wonderful time on their 21-day long D-Day Anniversary trip to Europe. Gloria remembers for both of them how they were wined and dined! Walter saved his D Company photo from Camp Mackall. He also had a favorite 82nd Airborne hat to which he pinned his jump wings with two battles stars.